Wear OS apps use the same layout techniques as handheld Android devices, but need to be designed with specific constraints. Do not port functionality and the UI from a handheld app and expect a good user experience. For more information on designing great wearable apps, read the Wear OS design guidelines. When you create layouts for Wear OS apps, you need to account for devices with square and round screens. 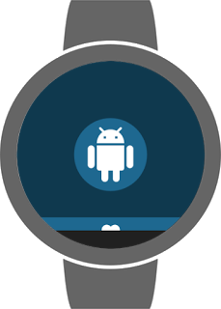 Content near the corners of the screen may be cropped on round Wear OS devices. Therefore, layouts designed for square screens can have display issues on round devices. Figure 1. Demonstration of how a layout designed for square screens does not work well on round screens. 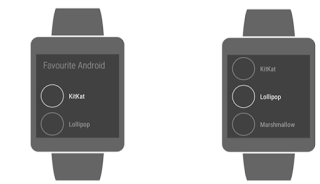 Using layouts in the Wear UI Library for both square and round devices. BoxInsetLayout - This layout applies different window insets depending on the shape of the device screen. Use this approach when you want to use a similar layout on both screen shapes without having views cropped near the edges of round screens. Curved Layout - Use this layout when you want to display and manipulate a vertical list of items optimized for round screens. Providing alternative layout resources for square and round devices as described in the Providing Resources guide. 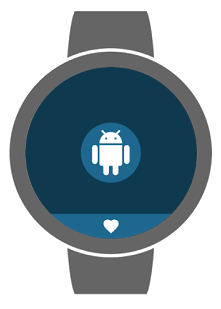 At runtime, Wear detects the shape of the device screen and loads the correct layout. Figure 2. Window insets on a round screen. The BoxInsetLayout class in the Wear UI Library lets you define a single layout that works for both square and round screens. This class applies the required window insets depending on the screen shape and lets you easily align views on the center or near the edges of the screen. 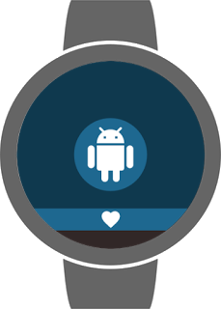 Note: The BoxInsetLayout class replaces a similar, deprecated class in the Wearable Support Library. A combination of top, bottom, left, and right. For example, a "left|top" value positions the child's left and top edges inside the gray square in Figure 2. The "all" value positions all the child's content inside the gray square in Figure 2. On square screens, the window insets are zero and the boxedEdges attribute is ignored. Figure 3. A layout definition that works on both square and round screens. This line assigns padding to the <BoxInsetLayout> element. The window insets on round devices are larger than 15dp, so this padding only applies to square screens. This line assigns padding to the inner FrameLayout element. This padding applies to both square and round screens. The total padding between the buttons and the window insets is 20 dp on square screens (15+5) and 5 dp on round screens. This line ensures that the FrameLayout element and its children are boxed inside the area defined by the window insets on round screens. This line has no effect on square screens. 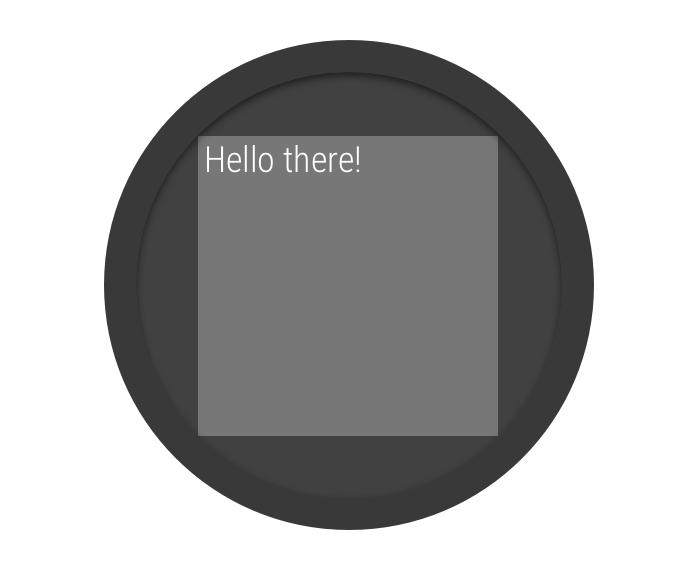 The WearableRecyclerView class in the Wear UI Library lets you opt-in for a curved layout, optimized for round screens. To enable a curved layout for scrollable lists in your app, see Creating a Curved Layout. A Wear device can have a square or round screen. Your app needs to be able to support either device configuration. To do this, you should provide alternative resources. Apply the -round and -notround resource qualifiers to layouts, dimensions, or other resource types. The layout/ directory contains layouts that work for both circular and square watches. The layout-round/ and layout-notround/ directories contain layouts that are specific to the shape of a screen. You can also use the res/values, res/values-round, and res/values-notround resource directories. By organizing resources in this way, you can share a single layout while changing only specific attributes, based on the device type. You should experiment with different values to see what works best. 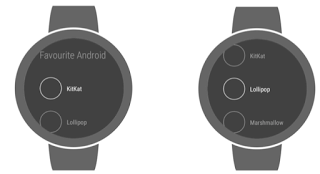 Some watches have an inset (also known as a “chin”) in an otherwise circular screen. If you don't compensate, some of your design may be obscured by the chin. Figure 6. Basic heart design. This activity_main.xml snippet defines its layout. If you do nothing, part of the design will disappear into the chin. Figure 7. No fix applied. Figure 8. Using the fitsSystemWindows attribute. Note that the top and bottom padding values that you defined are overridden to make everything fit in the system window. The way to fix this is to replace the padding values using an InsetDrawable. Figure 9. Using an InsetDrawables. If you require more control than what is possible declaratively using XML, you can programmatically adjust your layout. To obtain the size of the chin you should attach a View.OnApplyWindowInsetsListener to the outermost view of your layout.